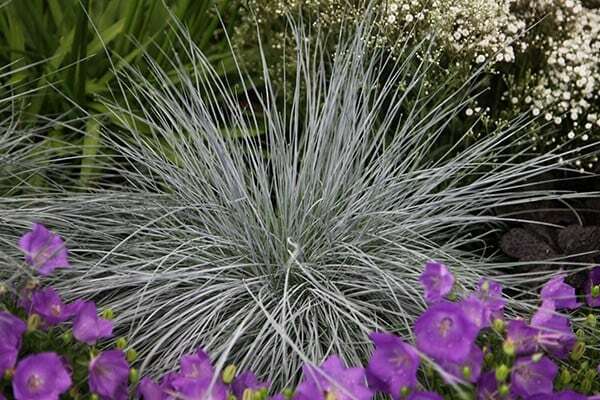 Providing the best steely blue foliage of all the shorter grasses, this undemanding ornamental look fantastic when drifted through a gravel garden, or when used in a Mediterranean-style planting scheme. It also works well in patio pots, where it will form a spiky topknot. It is mainly grown for it fine foliage, which has the best colour when it is planted in a spot that gets sun for the entire day, but it also produces bluish green flowerspikes in summer that age to straw. Garden care: Comb through the plant with your fingers in winter to remove dead foliage. Container-grown specimens should be watered well when they are establishing. Plants may need replacing every few years as they may become tatty-looking. This is stunning! Gorgeous compact shape, so attractive, with such a lovely vivid blue green colour. The flowers are delicate, like little arrow heads. I love it! Am going to replace all of my Elijah Blue glaucas with this one as it's so much more elegant and doesn't get tatty the way the other blue grasses do. I ordered 2 of this grass and planted one in a shady area and one in full sun. The one in the shade grew well but not as fast as the one in the sun. However, in last summer's heat the one in the sun lost some of its beautiful blue-green colour towards the end of the season whereas the one in the shade retained it until winter when it turned more green than blue. This plant is very attractive. Does this grass need cutting back in winter please? Hello, No, this is an evergreen grass so you dont need to cut it back, but you should just comb your fingers through it gently to remove all the dead growth.